“Do they always fight this hard?” I asked. “Oh yea,” my guide snapped back with a smile. A quick picture and the 14-inch smallmouth tore back into the depths. I was happy to be once again finding bronze in the scenic Missouri Ozarks. Guide Tommy Bench pushes his boat through a shallow area, with outdoor writer Bill Cooper close behind. Mostly a farm pond or big reservoir fishermen, I am always eager to satiate the need of fishing for the bronze torpedos of the streams in the Show-Me State. 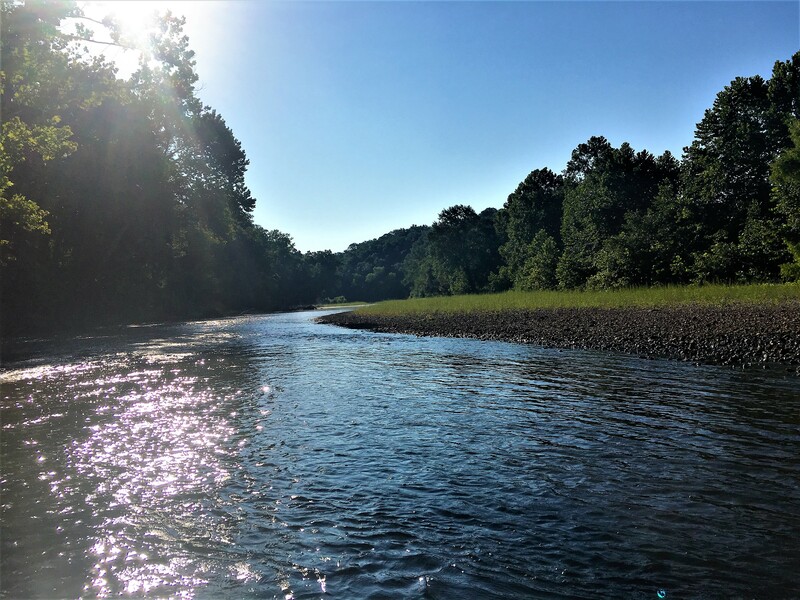 Last week, outdoor writer and friend Bill Cooper invited me down to fish the upper Gasconade River with Tommy Bench of Gasconade River Guide Service. It did not disappoint. We started early, with fog still rising, and fished all day. Hitting every pocket of shade, ripple of current, and deep hole the Gasconade offered. Even with the low waters of July, we landed countless 15-17-inch fish, with the biggest, pushing 4-pounds, spitting a buzzbait and forever haunting our dreams. Early morning on the Upper Gasconade River near Richland, MO. “I love this section of the river. I am always alone, and the fishing is incredible,” Tommy explained. We fished near Richland, floating nine miles and taking out at the Highway 7 bridge. He was right–we never saw a soul on the river, and the view was incredible the entire time. Coupled with being treated to a gravel bar gourmet breakfast from Bill, it could not have gotten any better. 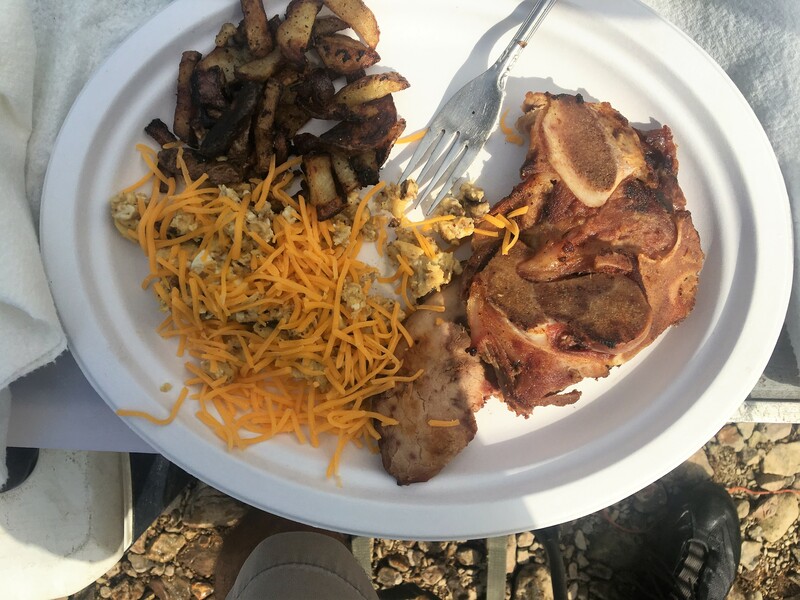 A breakfast of ham, eggs, and fried potatoes was just what we needed! 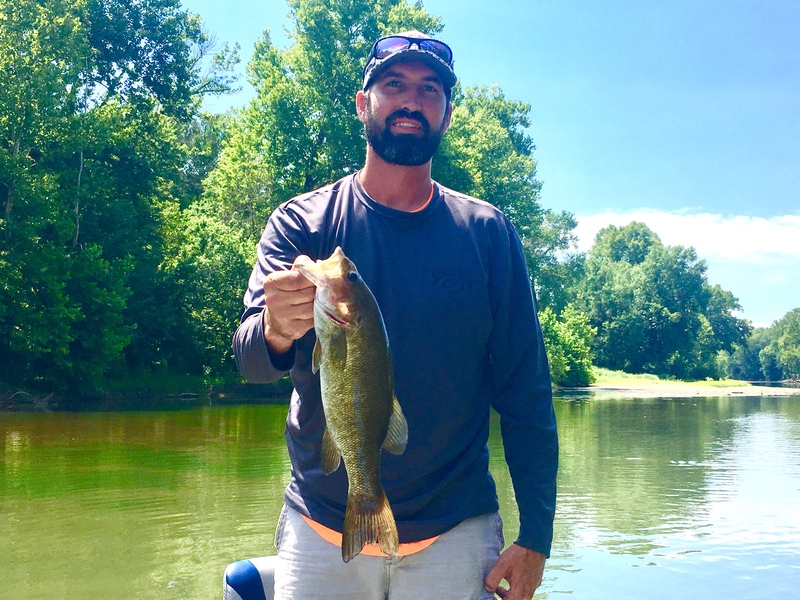 Tommy likes to fish the standard Ozark smallmouth baits–Ned rigs, jigs, and flukes. But, like me, he lives for big fish. Throwing his custom made double-blade buzzbait is by far the best tactic for big Gasconade River bronzebacks. “I would rather throw this bait 500 times and get one bite than fish a Ned rig and catch 30 fish,” he explained. About 20 casts in he had a blow up, but did not land the fish. “That’s what I am talking about, that was a big one.” Ten casts later and he had a 17-inch fish in the boat. An hour later Bill, throwing a chartreuse buzzbait, had the 4-pound fish on. Throwing a Strike King KVD 2.5 crankbait also proved successful in the deeper holes. Most of our bigger fish sucked in the chartreuse and black bait. Any time we came across a swift moving section of the river with some depth and cover, we pitched our Tackle HD plastic crawdads feverishly. More times than not, we had a strike. Yours truly had trouble landing fish, but they were hungry. Tommy with a 17-inch smallie. 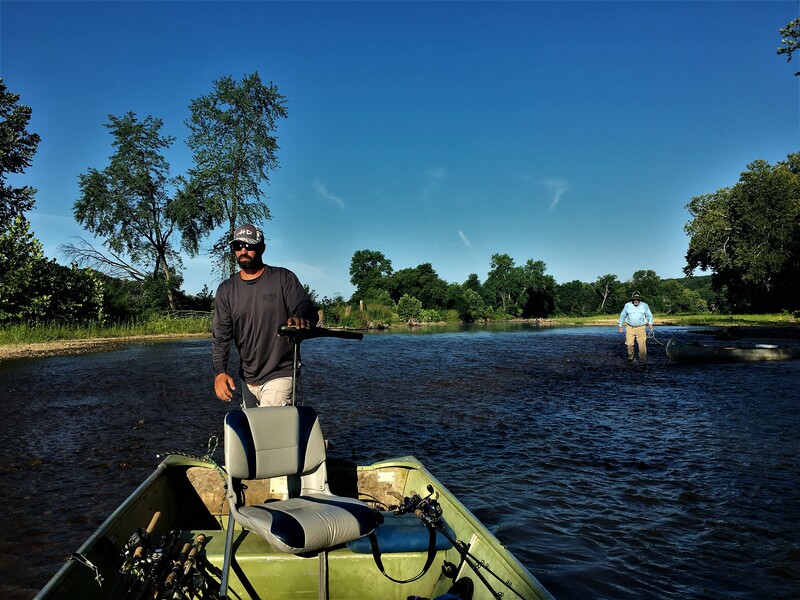 When the summer sun beats down making your local ponds and lakes hot, algae-infested, and tough, head to the Gasconade River. The cool, flowing water will be a much needed refreshment. Smallmouth are abundant, along with a myriad of fish, including largemouth bass, goggle eye, gar, drum and catfish. Put in, float and fish for a couple hours, then stop on one of the many gravel bars for swimming, lunch and beverages. The trough doesn’t lie on this fat bronzeback. Tommy Bench has been guiding on the Gasconade River for over11 years. He can be contacted via phone at 417-718-7716 or by sending him a message here. Fishing, Mahoney Outdoors, Missouri Ozarks, Ozarks Smallmouth Alliance, Ryan Miloshewski, Smallmouth Bass, smallmouth fishing, Tommy Bench. Bookmark.